Cleveland, OH--When the Parks & Recreation Department of Clinton, N.C., was named the winner the “Our Winning Green Spaces” contest they knew they would receive an Exmark Lazer Z X-Series mower package to help maintain the city’s parks and recreation facilities. What they didn’t expect to receive was a transformation. The “Our Winning Green Spaces” contest is sponsored by Project EverGreen in partnership with Exmark Manufacturing, the Sports Turf Managers Association (STMA) and The Foundation for Safer Athletic Fields for Everyone (SAFE). Clinton’s Royal Lane Park was the recipient of the park renovation. The park had fallen into disarray over the last decade due to budget constraints and aging park amenities, and was in need of a much needed upgrade. 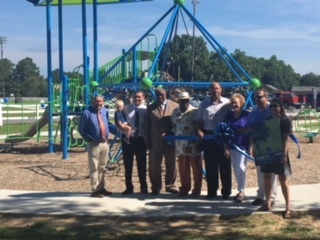 Numerous local green industry companies contributed to the renovation project which included the planting of nearly 100 trees, bushes, plants, applying of mulch, and installation of fencing around the playground which also had new equipment installed. The park’s multi-purpose natural turf athletic field was laser graded, re-sodded and the outdated irrigation system was replaced with a new commercial quality system. Fertilizer and weed control treatments were applied to improve the health of the turf. Nearly 150 children use the park and playground daily, and more than 500 young athletes participate in football and youth soccer leagues on the multipurpose field. Allen says the project brought together the community, city departments, and outside organizations to make a more beautiful park and enhance the existing facilities. Since 2015, Project EverGreen’s community-based renovation projects have revitalized more than 750,000 sq. ft. of athletic and recreational greens spaces in Atlanta, Cleveland, Detroit, Milwaukee; North Chicago, Ill.; Belle Plaine, Minn.; Greensboro and Durham, N.C., San Antonio, Ft. Worth and Round Rock, Texas; East Harlem, NYC; Hazlet, N.J., Portland, Oregon and San Marcos, Calif.